EVERYONE needs encouragement along the path to accomplishment. Christina Debi is a debut author from the Australian seaside suburb of Redcliffe. 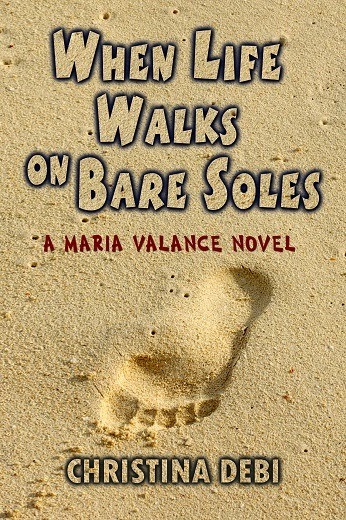 Christina’s novel When Life Walks on Bare Soles is a realistic comedy drama. Central character Maria has turned 55. The blurb introduces the rest of the story. “Single-divorced Maria enjoys life with a younger man, mysterious Dirk, and her bestie, zesty office workmate Josephine. But Life decides to complicate things. Dirk asks questions about her age. Handsome sensitive IT nerd Dominic wants a relationship. Maria’s boss Ursula bullies her. Back to that notion of encouragement for the newbie. Customer reviews have been encouraging. All in all, some sincere encouragement rewards the new author from Redcliffe. Here is what happened to a fatherless waif who received encouragement. Buy When Life Walks on Bare Soles HERE. Our song is one you don't hear much these days. Fantastic clip, BTW. Great shimmy at the start.